Like any stout-hearted Royal Navy midshipman or lieutenant, Jack Aubrey hungered for glory and for command of a ship. Indeed, the two were vitally connected, for the first was a path to the second and the latter -- with luck -- could bring the former. In the very first chapter of the first volume in Patrick O'Brian's magnificent series of novels about Jack Aubrey and his friend Stephen Maturin, Aubrey obtained his first real command on April 19, 1800. And glory followed. This web page explores all of Jack Aubrey's vessels from the small sloop-of-war HMS Sophie of which he takes command at the beginning of Master and Commander through more than a dozen other sloops, frigates and ships-of-the-line until we leave him in 21: The Final, Unfinished Voyage of Jack Aubrey on the ship-of-the-line Suffolk, having raised his flag as rear admiral. And for any who might protest at the imprecision in the title of this page, the Sophie being only a brig and thus not truly a ship by the definition of the sea, I must fall back upon the sage words of that eminent nautical authority, Stephen Maturin: "Let us not be pedantical, for all love!" For more than a decade I have been an avid fan of the nautical novels of Patrick O'Brian, an enthusiasm growing out of my long-standing interest in naval warships of the "Age of Fighting Sail" perhaps first sparked by childhood visits to "Old Ironsides". Oftentimes while reading these marvelous books, I have reached for the reference volumes on my shelves to better understand exactly what kind of vessel Jack Aubrey was commanding in the book in hand. And often I thought how convenient it would be to have a single source available to quickly find the basic information about the vessels, to look at their plans, and to compare one ship with another. These web pages are my effort to provide such a source of information. In many cases, Patrick O'Brian put Jack Aubrey aboard real Royal Navy vessels of the era of the Napoleonic Wars, although frequently the author altered the actual histories of those ships to fit the world of his fictional hero. At other times, ships commanded by Aubrey had clearly identifiable historical prototypes, but with names and circumstances changed for the novels. 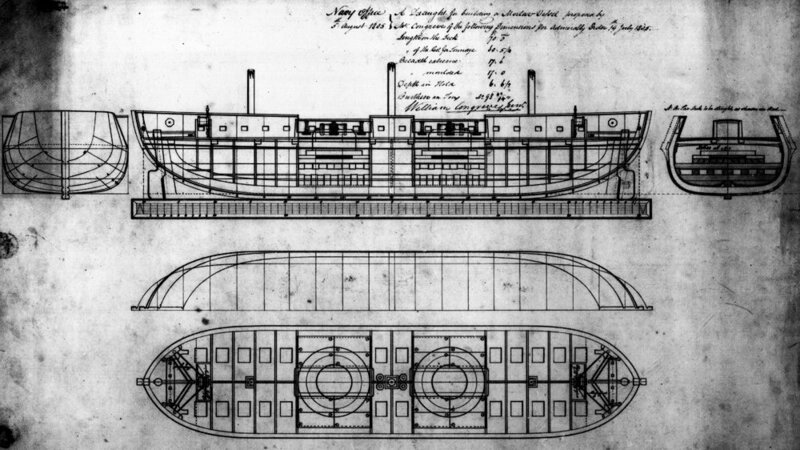 For these historical vessels, whether commanded by Aubrey under their actual name or one fictional, a description of that ship is given below, accompanied by basic technical data and an image of the actual ship plans. Occasionally O'Brian invented a warship without obvious specific precedent. In those cases, a genuine vessel of appropriate design has been selected for presentation, again with data and plans. I wish to thank Don Seltzer, a fellow listswain of the Patrick O'Brian Gunroom and of John Berg's Sea-Room, for his help by reviewing the material for presentation on these web pages and for providing me with some nuggets of information that otherwise would have escaped my eye. Ship's Technical Data: In general the information given for each vessel is that applicable at the time of the original commissioning in the Royal Navy. Although the hull dimensions generally remained essentially unchanged throughout a ship's career (except in cases of major rebuilds of a type not applicable to any of Aubrey's commands), crew size and armament sometimes did substantially alter over years and decades of service. Gun types and quantities especially shifted around the beginning of the 19th Century when short-ranged but powerful carronades replaced many of the smaller-caliber long guns carried on quarterdecks and forecastles. Thus, the weaponry information presented here is not necessarily correct in all details for the period of Jack's Aubrey's command of the ship in question, although usually the main battery of guns is the same (a notable exception is HMS Surprise which under Aubrey's command typically carried 12-pound long guns, not the 9-pounders of the original armament scheme nor their 32-pound carronade replacements). Nominal crew sizes were adjusted from time to time and, of course, ships frequently served with crews under authorized strength. Length - The length of the Lower Deck (the "lower deck" on a ship-of-the-line was that deck upon which the heaviest guns were placed; for frigates it was the deck immediately below the deck holding the main battery of cannons). This is the rough equivalent of "length between perpendiculars" for modern ships. Keel - Not the length of the actual keel, but an artificial number used for calculations of tonnage. Breadth - The "moulded" breadth at the widest part of the hull, "moulded" meaning the measurement was made to the outside of the hull frame, but inside the external planking. Hold - The "depth in hold" was another artificial number sometimes used in calculating tonnage. The dimensions cited for ships built for the Royal Navy are "as built" figures, if available; otherwise they are from the design plans; those for foreign prizes are "as built" figures taken during a survey after capture. Tonnage: An artificial figure indicating not "displacement" as with modern ships (in essence, the weight of the ship) but a theoretical carrying capacity or "burthen". By the late 18th Century the standard formula for calculating tonnage was known as the Builders Old Measurement in which the Length minus three-fifths of the Breadth was multiplied by the Breadth times one-half the Breadth and then divided by the number 94, yielding the calculated tonnage of burthen (and explaining why the tonnage of vessels of this era usually include an odd fraction with "94" as the divisor). An equivalent technique was to multiply the Keel times Breadth times one-half Breadth and then divide by 94. The significance of such tonnage figures is that they permit a standard for a comparison of the relative overall size of different ships. Special HMS Surprise page: A longitudinal section and plans of all decks have been prepared for Jack Aubrey's favorite frigate, together with detail descriptions and portraits of the ship's officers. Click here to access the plans. You may return via the "Ships of Jack Aubrey" button. "... she was a slow brig, an old brig and a brig that was very unlikely to make his fortune." 1800 - 1801: Jack Aubrey's first command, described in Master and Commander is the brig-rigged "sloop" HMS Sophie, operating out of Port Mahon in the western Mediterranean. Towards the end of the novel, the first book in the series, Sophie is captured on the Spanish coast by a French squadron led by Admiral Linois. Although the activities of the Sophie and her dimensions and armament were modeled closely on those of real-life HMS Speedy, commanded by Thomas, Lord Cochrane, the quarterdeck - unusual for a small sloop - was taken from HMS Vincejo, captured from the Spanish navy in 1799. Indeed, In the novel the Sophie is pointed out by one naval officer as being the former "Vencejo" - an alternative spelling - although in fact the Vincejo kept its original name while serving in the Royal Navy until captured by the French at Quiberon Bay in 1804. The Speedy, like the fictional Sophie, was captured in 1801 by Linois. "She was known as the Carpenter's Mistake, and no one in the service had ever imagined she would be launched." 1803 - 1804: The Peace of Amiens and an anxious journey through France and Spain after hostilities resumed delay Jack's assignment in Post Captain to a new command until he is given the very unconventional ship-sloop HMS Polychrest, an unusual vessel with sharp ends at both bow and stern, no tumblehome (inward curvature at the top of the hull), drop keels (similar to daggerboards on some modern sail boats), and the remnants of the launching system for an unsuccessful secret weapon (a giant rocket). After several months of service in the English Channel, the Polychrest is severely damaged in a raid on a French port and sinks soon thereafter. The physical form of the Polychrest (except for the secret weapon) was taken from the Dart class of sloops. The sliding keels, originally designed by Captain Schank, were employed upon a number of small Royal Navy vessels around this period, although problems with leaking centerboard cases perhaps discouraged wider experimentation. Unlike the Polychrest with its extraordinary leeway and a propensity for missing stays, the real HMS Dart and her sister ship Arrow performed satisfactorily during their Royal Navy service. The Dart was broken up in 1809. The poor sailing qualities of Polychrest and perhaps the notion of a new secret weapon were likely taken from HMS Project, a much smaller vessel than the Dart (and Polychrest) with a very shallow draft to carry a new design of howitzer into coastal waters. The Project was broken up in 1810 after only five years of service. "No wonder they called her a crack frigate: her sailing qualities were quite out of the ordinary, and the smooth quiet discipline of her people was beyond anything he had seen." 1804 - 1805: Jack's success in raiding the French port, despite the loss of the Polychrest, bring him promotion in Post Captain to the rank of, naturally, post captain and the temporary command of the 38-gun frigate HMS Lively. With the Lively Jack takes part in the interception of a Spanish treasure squadron in the Atlantic. After participating in blockade operations in the western Mediterranean in H.M.S. Surprise, Jack Aubrey relinquishes command of the frigate to her regular captain and returns home to England. The Lively was a genuine Royal Navy ship. However, Patrick O'Brian did alter the ship's history for purposes of his fiction. In Post Captain the frigate is described as having served for a considerable period in the East Indies when in fact the Lively was launched and commissioned in 1804, the same year when Jack Aubrey takes command. The Lively was lost in a wreck near Valletta while escorting a convoy to Malta in 1810. "... he knew her through and through, as beautiful a piece of ship-building as any that had been launched from the French yards, a true thoroughbred, very fast in the right hands, weatherly, dry, a splendid sailor on a bowline, and a ship that almost steered herself once you understood her ways." 1805 - 1806: Through the intervention of Stephen Maturin at the Admiralty in H.M.S. Surprise, Jack Aubrey is given the small frigate HMS Surprise of 28 guns, aboard which he had served years before as a midshipman. His assignment is to carry a diplomat to the East Indies, where he uses his ship to support the China Fleet of East India Company merchantmen to successfully fight off Admiral Linois's squadron. Afterwards, Jack and the Surprise return across the Indian Ocean to the Atlantic and head northwards towards home. HMS Surprise is another genuine Royal Navy ship, although with a rather different history than that portrayed in O'Brian's novels. The historical Surprise was originally the French l'Unite, captured in 1796. Although this accords well with Jack's comment that she had been taken from the French "early in the last war" (evidently meaning the French Revolutionary War, beginning in 1793), Jack's other descriptions of her past do not so well match history. His mention of having served aboard her as a midshipman would require her service in the Royal Navy during the 1780's, and his frequent references to her great age are not appropriate for a ship launched in 1794. 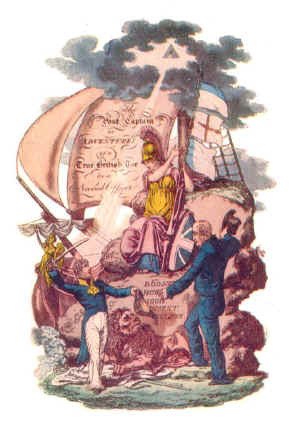 (In a later novel, however, by way of contrast Jack does refer to her capture by the Royal Navy in 1796.) In one important aspect the fictional description of the Surprise agrees with history: while Captain Edward Hamilton had been in command, he ordered the installation of a mainmast of a size usually specified for a 36-gun Fifth Rate frigate, giving her a unique appearance. The real Surprise was sold out of the service in 1802, three years before Jack Aubrey fictionally takes command. The action of Linois against the China Fleet was genuine, although the real Surprise did not take part, and it actually occurred in 1804 while the fictional Jack Aubrey was still in command of the Polychrest. Armament: Upper Deck twenty-four 9-pound long guns, Quarterdeck eight 4-pound long guns and four 12-pound carronades, Forecastle two 4-pound long guns and two 12-pound carronades. Apparent actual armament: Upper Deck twenty-four 32-pound carronades, Quarterdeck eight 18-pound carronades, Forecastle two 6-pound long guns. "... the Boadicea proved she was a dry, wholesome ship." 1809 - 1810: At the opening of The Mauritius Campaign, Jack has been ashore for a lengthy period of time, very probably since he left the Surprise. Again through the action of Stephen Maturin at the Admiralty, Jack Aubrey is given command of the 38-gun frigate HMS Boadicea, with the prospects of being commodore of a squadron of ships to be directed against Mauritius and the nearby islands in the Indian Ocean. After the successful conclusion of the campaign, Jack is ordered home in his ship to carry the happy news. Boadicea is another real Royal Navy ship, and there is nothing in O'Brian's description of her which conflicts with her genuine history. In fact, the Boadicea was Commodore Josias Rowley's ship in the Royal Navy's Mauritius campaign, in which Rowley actually performed the activities assigned in the novel to Jack Aubrey. She was eventually broken up in 1858. Armament: Upper Deck twenty-eight 18-pound long guns, Quarterdeck fourteen 32-pound carronades, Forecastle two 9-pound long guns and two 32-pound carronades. "... the Raisonable was built fifty years ago, and if she fired a full broadside she might fall to pieces." 1809: In The Mauritius Campaign Jack temporarily gives up command of the Boadicea during the early phases of the campaign in order to transfer aboard an elderly 64-gun ship-of-the-line, HMS Raisonable, but once the hurricane season nears he resumes his place on the frigate for the remainder of the campaign. The Raisonable was another genuine Royal Navy vessel of the Ardent class of Third Rates, launched in 1768 and hulked in 1810. By the time of the Mauritius campaign, 64-gun ships were considered too small to normally take a place in a line of battle and were often relegated to such service as being the flagship of a squadron on foreign duty.